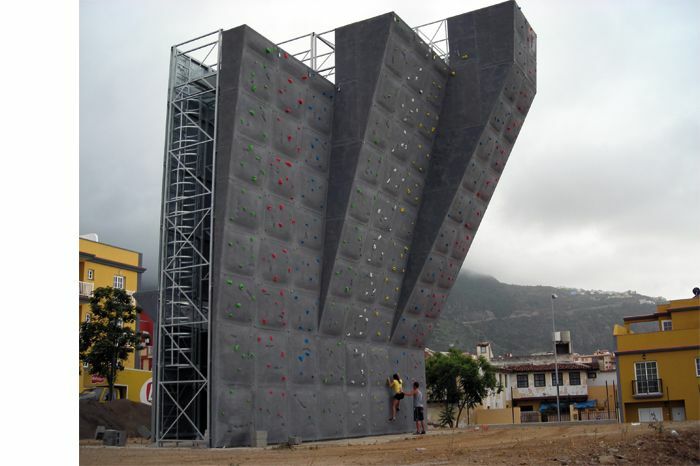 Tenerife is now in the forefront when it comes to artificial climbing walls in Spain. Top30 won in competition with other wall manufacturers a tender for a huge climbing installation in Los Realejos and was commissioned by the local council to undertake this project. The new wall has been built near the Playa del Socorro (beach) and the highest part of the wall is 15 meters above ground. The width of the wall is 12 meters and on the back of this free-standing monster there is a bouldering wall stretched the width of the wall and with a height of 4 meters. The delivery included no less than 2800 bolt-on holds and a safety floor below the bouldering section, as well as a lot of climbing gear for the future establishment of a municipal climbing school.